Transparency International (TI) is the world’s leading non- governmental anti-corruption organisation. With more than 100 chapters worldwide, TI has extensive global expertise and understanding of corruption. Transparency International Defence and Security (TI-DS) works to reduce corruption in defence and security worldwide. Civil Society Legislative Advocacy Centre (CISLAC) is a non-governmental, non-profit, advocacy, information sharing, research, and capacity building organisation. Its purpose is to strengthen the link between civil society and the legislature through advocacy and capacity building for civil society groups and policy makers on legislative processes and governance issues. Link to the original document here. This report analyzes the correlation between defence sector corruption in Nigeria and the country’s weakened counterterrorism capacity with regard especially to Boko Haram. Through accumulated political patronage and longstanding military exceptionalism, roughly US $15 billion has been stolen in recent years by Nigeria’s former military chiefs , compromising oversight of security affairs and therefore allowing for increased terrorist activity throughout the country. WATHI has chosen to focus on this report because it clearly outlines the context and opportunities for as well as the consequences of defence sector corruption. Additionally, the document proposes several recommendations for minimizing corruption in order to further promote counterterrorism strategies and general political stability. While President Buhari’s administration has worked to significantly diminish security sector corruption, a more comprehensive set of policies is needed if Nigeria hopes to truly combat such deeply entrenched corrupt practices. Pourquoi avons-nous choisi ce document? Ce rapport analyse la corrélation entre la corruption dans le secteur de la défense au Nigeria et la faible capacité du pays à freiner le terrorisme, particulièrement celui relatif à Boko Haram. Du fait d’un clientélisme politique et d’un « exceptionnalisme » militaire qui perdure, quasiment 15 milliards de dollars US ont été détournés ces dernières années par d’anciens généraux de l’armée au Nigéria. Ces agissements compromettent le contrôle sur les affaires de sécurité et permettent ainsi une recrudescence des activités terroristes dans tout le pays. 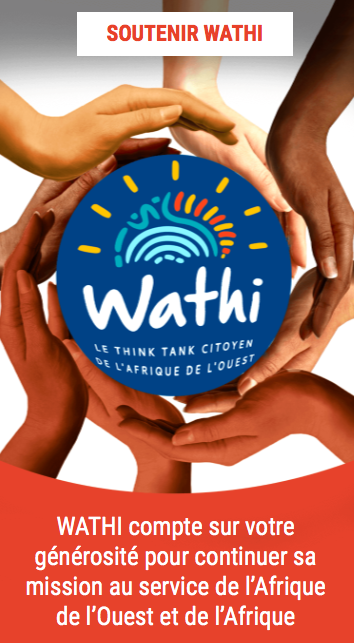 WATHI a choisi de mettre en avant ce rapport parce qu’il décrit aussi bien le contexte et les opportunités que les conséquences de la corruption dans le secteur de la défense. De plus, ce document propose quelques recommandations pour réduire la corruption afin de promouvoir davantage de stratégies de lutte contre le terrorisme ainsi qu’une stabilité politique. L’administration du président Buhari a fourni de nombreux efforts pour réduire la corruption dans le secteur de la sécurité, mais une stratégie plus accrue est indispensable si le Nigéria espère véritablement combattre les pratiques corruptives aussi profondément ancrées dans l’armée. Defence sector corruption can evolve from political patronage, kleptocratic practices, excessive secrecy, military exceptionalism and the compliance of international partners. The proven consequences of this corruption, as seen in Nigeria, is the diminished utility of counterterrorism operations as well as the empowering of terrorist groups such as Boko Haram. While this document focuses solely on Nigeria, these contexts and consequences are shared by many countries in the region and have the possibility to arise in those not yet facing such a challenge. The report offers seven recommendations regarding counterterrorism strategies in Nigeria, all of which may be applied to other countries in the region. 1) Develop a unified anti-corruption strategy for the defence sector. 2) Extend public access to defence and security information. 3) Monitor confidential procurements of any kind. 4) Abolish or strictly regulate secretive security votes, enabling citizen oversight of the security sector’s spending. 6) Encourage international actors to priortise anti-corruption efforts in their military and diplomatic engagements in the region. 7) Shut-down banks’ money laundering loopholes. Quelles leçons pour les pays de la zone de WATHI? Le rapport révèle que La corruption du secteur de la défense est favorisée par le clientélisme politique, les pratiques “kleptocrates”, le secret excessif sur l’armée, “l’exceptionnalisme” militaire et la complicité de partenaires internationaux. Les conséquences de cette corruption observées au Nigeria, incluent l’efficacité limitée des opérations de lutte contre le terrorisme et renforce la capacité de nuisance de groupes terroristes tels que Boko Haram. Bien que ce document se concentre spécifiquement sur le Nigéria, certains éléments sont d’un grand intérêt pour les autres pays de l’Afrique de l’Ouest et leurs stratégies de lutte contre la corruption. Ce rapport propose sept recommandations concernant les stratégies de lutte contre le terrorisme au Nigéria dans le secteur de la défense. Elles peuvent être appliquées dans les autres pays de la région. 1) Développer une stratégie anti-corruption unifiée pour le secteur de la défense. Defence sector corruption is a major threat to Nigeria’s internal security and political stability. Largely unaddressed, it has weakened Nigerian counterterrorism capacity whilst strengthening Boko Haram. Former military chiefs have stolen as much as US $15 billion- a sum equivalent to half of Nigeria’s foreign currency reserves- through fraudulent arms procurement deals. Longstanding military exceptionalism meanwhile, has justified weak and compromised oversight of security-related spending and excessive secrecy. By far the most significant corruption opportunities are those exploited through inflating procurement contract values and creating “phantom” defence contracts. Such contracts are used as a vehicle for money laundering. Only a holistic reform agenda can deliver the deep, systemic changes and improvements in transparency and accountability needed to prevent the next US $15 billion quietly leaving Nigeria through the back door. Develop a unified anti-corruption strategy for the defence sector. Consideration should be given to engaging all levels of staff and grounding anti-corruption efforts in an analysis of the main opportunities, causes and enablers of corruption. Establishing a high level leadership steering committee, or “Reform Board”, responsible for setting direction would help ensure the reform process develops momentum. Extend public access to defence and security information. Guidelines for separating confidential from non-confidential information… would help limit abuses by setting out what information on budgets and procurements could be disclosed. This would help create meaningful transparency in defence budgets and allow for more effective oversight by the organisations mandated to perform this role. Civil society and the media are powerful monitors, and the Procurement Act empowers both to monitor tender awards. Guidelines for non-classification would enable civil society to extend its monitoring to the defence sector, thereby realising a function originally envisaged in the legislation. The President, state level governors or the Attorney General could work with civil society and the National Assembly to publish guidelines that allow for proper scrutiny of how such funds are budgeted, spent and monitored. Declassifying how the security vote funds have been spent, after a two year information embargo, could also enable citizen oversight. More whistle-blowers would be encouraged to come forward with evidence of defence sector corruption with the enactment of a whistle-blower protection law that includes citizens and private sector employees. Sharpen international focus on fighting corruption in Nigeria. International actors need to prioritise anti-corruption in their military and diplomatic engagement strategies with Nigeria. States should actively deny visas to officials implicated in corruption. Governments repatriating recovered assets to Nigeria should set up independent monitoring arrangements, and include transparency and accountability standards as principles for repatriation. Close off banks’ money laundering loopholes. Banks facilitating money laundering should be sanctioned or shut-down by the Nigerian Central Bank. Building partnerships with international offshore financial centres that see a high rate of money laundering by Nigerian defence officials such as London, New York and Dubai will assist information sharing, as will leveraging private sector financial intelligence. Violent extremism thrives as a result of exploitative governing structures and state predation. Terrorist groups motivated by radical political and religious ideologies have destabilized Syria, Afghanistan, Libya, Iraq, Somalia, Nigeria, and other weak or misgoverned states. These groups have been able to co-opt disaffected populations by leveraging popular antipathy toward corrupt governments, often by presenting their own radical agenda as having greater moral value and popular legitimacy than the secular governments they seek to destroy. Predation by these regimes – whether it takes the form of elite corruption, security force abuses, or ethno-religious chauvinism – serves to validate extremist narratives about the immorality of secular governance. Yet for the vast majority, corruption remains endemic and systemic, warping the social contract between the government and citizens. Patronage – not performance – is the ticket to advancement. Securing a prosperous future for nearly 180 million people will be tough. The continent’s largest economy has, since 1970, suffered from the largest per annum illicit financial outflow on the continent as corrupt actors seek to exploit banking loopholes to launder and hide their unlawful assets. An estimated US $217.7bn was illegally transferred out of Nigeria between 1970 and 2008. The same study estimated that illegal transfers from the African continent have tripled since 2001. Corruption has been particularly destructive in the defence and security sector. Overlooked in peacetime, defence sector corruption has devastating real world consequences when conflict flares. With lower oil prices, corrupt elites have increasingly exploited alternative illicit revenue streams. The secret nature of defence and security budgets has made them the easiest and most lucrative opportunity to exploit. To stop today’s assets being misappropriated, defence sector reform must be an equal priority to enforcement and repatriation, or Nigeria’s leaders will always be chasing the past. With evidence uncovered by the two ad hoc audit committees established by President Buhari, the Economic and Financial Crimes Commission (EFCC), Nigeria’s main anti-corruption agency, has indicted over 300 individuals and companies for defence sector procurement theft and misappropriation. Fifty-five people, including former government ministers, military chiefs, state governors, and bankers were reported by the committees to have stolen 1.34 trillion naira ($6.8 billion) over a seven-year period in the shape of arms equipment deals. A further $2 billion was allegedly stolen from the National Security Budget under the watch of National Security Advisor, Colonel Sambo Dasuki. The amounts stolen are shockingly bold. Yet the misappropriation of budgets to buy political support is not new. Successive Nigerian leaders, both civilian and military, have built governmental power structures around the country’s main income stream: oil. And until recently oil revenues have typically accounted for up to 70 per cent of government revenues – feeding powerful patronage networks. The drop in Nigeria’s state oil revenues has hit oil sector rents hard, and this has led Nigeria’s corrupt elites to raid defence and security sector budgets to maintain their power bases. With defence budgets forming close to 20 per cent of total government spending in 2017, the sector offers lucrative rewards to Nigeria’s corrupt elite. According to the former Head of the Bureau for Public Procurement (BPP)- the agency established to monitor, oversee and set standards for government procurement spending- 90 per cent of bribes in Nigeria occur through procurement. While some of this money is stolen for individual profit, a great deal is dispersed through complex patronage networks. As former Central Bank Governor Lamido Sanusi phrased it, “corruption in Nigeria is not mindless…it is calculated and systematic.” Sustaining political patronage is a system, a system that was previously predominantly funded by the oil sector but is now increasingly relying on plundering of the defence and security budget. The oil and defence sectors were exploited to record levels in order to sure up an extensive patronage network and safeguard President Jonathan’s political future. These kleptocractic networks have yet to be disabled. What is overwhelmingly clear from the results of the ad hoc audit committee investigations is the extent of unmonitored, systemic control over the defence sector by senior government elites. The lack of clear separation between the executive and the military is a long running problem. Kleptocratic capture of the defence sector rests on three pillars: capture of defence budgets and income, capture of defence spending and procurement, and capture of senior military posts. Facilitating this capture are powerful senior figures- godfathers- who select and appoint personnel to defence sector positions, in order to operationalize systemic control over security finances. The system facilitates control from the highest levels of the political party to the lowest levels of the military. In any country, a proportion of spending must remain confidential for security reasons: typically 15 per cent, including among states in conflict. Yet Nigeria classifies nearly all defence contracts and budgets, and considers any broadly-defined security-related matter ‘secret’ by definition. As a result, Nigeria ranks among those countries at the highest risk of corruption due to the over-classification of budget data and weak oversight of secret budgets. This culture of secrecy is often openly hostile or vengeful towards journalists and civil society. In December 2015, soldiers reportedly perpetrated gross human rights violations during two separate military crackdowns in Zaria and Onitsha. In response to these allegations the Nigerian Army has labelled its critics as “unscrupulous and unpatriotic”. Moreover, there has been a long standing culture among senior officers that rank has its privileges and that promotion to top echelons comes with the prerogative to use one’s position for personal gain. This heavily undermines public trust. 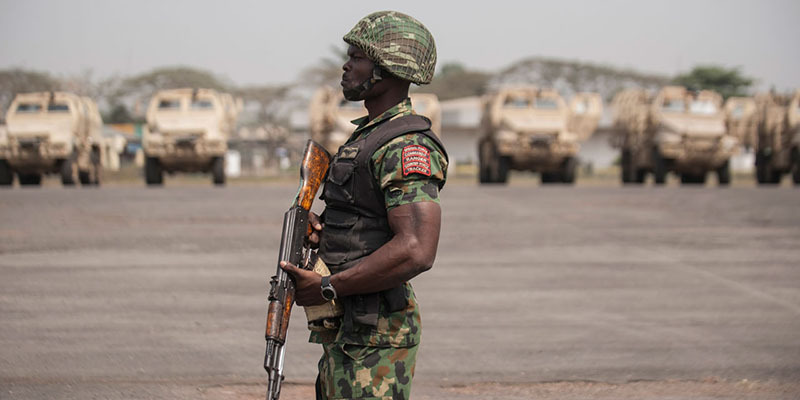 Despite Nigeria’s 1999 return to democratic rule, the oversight exercised by civilian officials and other watchdogs over the military and security agencies remains very weak. Weak accountability has enabled powerholders along the entire defence spending chain to misappropriate state funds, from the Presidency down to unit commanders at ground level. International military partners have a part to play and have done precious little to disincentivise Nigerian security-sector corruption. By failing to integrate effective anti-corruption measures into their security engagement policies, partners are inadvertently diminishing the impact of their military assistance. US military and police aid to Nigeria, totalled US $45.4 million from 2010 to 2014, but was just a small fraction of the more than US $2 billion in security funds that was allegedly stolen by Nigeria’s previous National Security Advisor – who for three decades enjoyed a close relationship with Washington. Key international suppliers of Nigerian military hardware are facilitating fraud by agreeing to uncompetitive or unorthodox contracts. In 2013, Nigeria officials reportedly skimmed US $20 million from an internet surveillance contract directly awarded to an Israeli company in defiance of public procurement competition rules. International partners are missing opportunities to encourage reform. The United States’ efforts to sell 12 A-29 Super Tucano light attack aircraft to the Nigerian Air Force – whose last three chiefs, along with other senior officers, are currently on trial for embezzlement and procurement fraud – looks like business as usual. The most effective action against asset flight is to prevent it occurring in the first place; and here the Nigerian and international financial sectors could play a much greater role. Recent evidence from the Presidentially-appointed ad hoc Audit Committees has shown that stolen funds often pass through multiple accounts before being moved offshore beyond the reach of domestic authorities. As facilitators of corrupt funds, both Nigerian and international banks need to raise their standards of governance and control. Those that repeatedly fail should be sanctioned or shut down. Aside from the evident waste, the kleptocratic capture of the defence sector has had serious consequences for the security of Nigerians. In a December 2015 court martial, 66 soldiers on trial for mutiny had their death sentences commuted after the court heard that the soldiers had pleaded to be given weapons and equipment to combat the insurgency, but the funds had been stolen. The corruption-fuelled under-resourcing of front-line troops has also indirectly benefitted Boko Haram. Photographs and video footage testify to the terrorist group’s use of captured army vehicles and sophisticated arms abandoned by disintegrating Nigerian units, which have been key to the operational success of the terrorist group. The culture of impunity within the security forces has indirectly helped Boko Haram to recruit and radicalise a generation of young north-eastern Nigerian males. Many have been impacted by the military’s indiscriminate arrest, interrogation, and detention practices. Since 2011, most significant were the deaths of several thousand young men, many of whom had no connections to Boko Haram, from torture, starvation, and neglect at army-run detention facilities. Although such deaths declined sharply in 2014, they have nevertheless continued under President Buhari’s government. Creating inflated or phantom contracts is still one of the easiest ways for corrupt actors to steal from the Nigerian defence budget. In 2014, former NSA Dasuki awarded a US $500 million contract for refurbished helicopters to Triax Company Limited, whose CEO at that time, according to media reports, was Arthur Eze, a major financier of the PDP and a family friend of former President Jonathan. The helicopters had limited to no combat utility and have not been deployed. Another common tactic in corrupt defence contracting is the use of ‘briefcase companies’: shell companies that exist only on paper. The Nigerian defence budget lacks sufficient detail for anyone—including the Ministry of Finance or the National Assembly’s defence-related committees—to oversee and account for defence spending. The bulk of military hardware procurement for example, is not described in the annual budget of the MOD but is paid for using opaque ad hoc funding and accounting mechanisms. A relic of military rule, security votes are catch-all line items inserted in the budget to give recipients the flexibility to cover extra-budgetary security expenditures. But, in practice, they are used as opaque slush funds spent with no legislative oversight or outside scrutiny. Shortly after taking office in May, President Buhari vowed to “plug revenue leakages.” However despite taking steps to tighten control over public spending, President Buhari’s 2016 budget contains over 30 so-called “security votes” for the president and state governors, amounting to N210 billion (£ 540 million) annually. The 2007 Public Procurement Act harmonises government procurement policies and practices, and establishes the legal framework for third party oversight of tender specifications, bidding, and contract awards. The act has a host of powerful anti-corruption mechanisms though the lack of classification guidelines means that not all of these are being fully utilised. Other strong provisions exist within the Act that could be employed to drive up defence sector contracting standards. These provisions include powers for public authorities to exclude (debar) suppliers where there is evidence of fraudulent behaviour (including a failure to fulfil properly a previous government contract), collusion, fake documentation, fraud and corruption. The exclusion of poorly run or corrupt companies from public procurement is an important part of incentivising a responsible and competent supply chain and has been successfully employed in the United States, including for defence procurement. Critically, there are no current guidelines setting out what information on budgets and procurements is classified or could be disclosed, opening up the classification mechanism to continued abuse. Classification guidelines are urgently required to achieve full implementation of this law. These guidelines should include a public interest test, which would allow the military to separate confidential from non-confidential information, and proactively release non-confidential information. It would also enable civil society and the media to challenge instances where the defence sector has not released information, in apparent contravention of the public interest test.